I recently re-read Salem's Lot by Stephen King, perhaps in some irrational avoidance of a commitment to read Bram Stoker's Dracula for a 2006 challenge. I read Salem's Lot first more than 20 years ago, and the story stayed with me. But the details were vague. 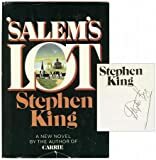 Salem's Lot is clearly a derivative work, intentionally so - the introduction by the author is a wonderful explanation of his approach and motivations. But it is derivative in the sense that an heir is derivative of one's ancestors - the comic book vampires, Stoker's masterwork, and all the other stories of blood-suckers over the years. Barlow, the villain of Salem's Lot is first only referenced obliquely by reference from other characters. This highly clever ruse of secreting the villain away succeeds wildly - such that the villains first intro in the junkyard seems as well orchestrated as a formal debutante ball in the finest noble estate. Comparing Barlow to other favorite vampires - LeStat, Silas, and the current crop of vampires in horror films - Barlow comes off as the most evil - unrepentantly evil - of them all. And compared to the current crop of dewy-eyed, sympathetic vampires cropping up in teen chic lit books, he cuts a sinister figure. So now I should really read Dracula, right?